Publisher/Year/Pages: Vintage 2006; 228 pages. How I got this: Bought it. Why I read it: The College Students group (on Goodreads) that I created/moderate picked it as the August group read and I'm just now getting to it.. Rating: See my final thought below. I give it four stars. 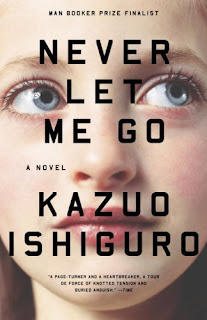 Set in dystopian England, Never Let Me Go tells the story of Kathy, Ruth and Tommy and their experiences from childhood and adolescence at their secluded boarding school told from the perspective of a grown-up Kathy reflecting on this time in her life. It deals intimately with your typical coming of age experiences but, like all dystopian novels, there are some very strange and mysterious aspects to their school and their lives--unexplained rules and happenings and being told of how "special" they all are. I have to say that from pretty early on I was just completely fascinated by this society and wanted to know everything there was to know! But the way Ishiguro writes this novel was very incongruous to my need-to-know-everything-now attitude. I've always read reviews that describe a story as "controlled" and I've never really understood what that meant but this novel is the epitome of a controlled story. You get bits and pieces of this dark cloud of a mystery that is just hanging over the whole story. He'll bait you with some enticing little tidbit that lets you in on their world and then just keep reeling you along, slowly handing out clues and small fragments of the bigger picture. It was completely effective and I was on the edge of my seat screaming, "Come on Ishiguro-- I WANT THE WHOLE ENCHILADA! "..but in a good way! But in the end, this method of giving you bits and pieces was effective because I felt like, at the end, we find ourselves completely up to speed with the main characters. We are finally at a place where we understand everything that they do about their lives and I felt the emotion that they did as soon as things were revealed to them about who they were. I felt their horror and sorrow. I was really irked because I'm normally that annoying person that figures out the twist in a movie before everyone else and I couldn't figure this out right away! My boyfriend always groans while watching CSI with me because I always figure out the killer early on. I digress. But anyways, it took me a while to kind of figure out the mystery behind everything and why these students were so "special." It took me a little bit to get used to the way it was written from Kathy's memories. It was quite jarring in some ways and she'd literally be talking about something and then skip off into another memory and then realize that she needed to finish her point from before and go back to it. It wasn't at all in a linear manner. It takes some getting used to. Not going to lie. But then I was sitting there thinking about it, about halfway through the book, and realized that that is exactly how memories are. I often find myself going from one thing and then some other memory is triggered. After that I thought about it a bit differently. The writing itself was really accessible and craftily done but don't let that fool you..this is an incredibly DEEP and moving novel. I really found myself moved by this story and can't wait to see the movie but know that I'm going to bawl like a baby considering I did after watching the previews for it upon finishing the book. The ending was so heartbreaking and moving. Without saying too much, this book would be an excellent platform to talk about some ethical issues and it raises many questions that I've found myself asking before. This book, to me, seemed much more realistic than other dystopian novels. I caught glimpses of our society in the proverbial mirror while reading this novel. And that is scary! My final thought: Should you read this book? That depends. If you are intrigued because it is a dystopian sort of novel--don't expect a Hunger Games or anything fast-paced like that. This story just isn't that. It doesn't have a loud rebellion but focuses on quieter "rebellions" and characters who might not try to fix their destiny or the world. If you are looking for a non-brainbusting piece of literary fiction that has elements of science fiction and dystopian society full of suspense and the inner workings of human beings, then I'd say go for it! I'm reallllly getting into these dystopian novels! Any suggestions?? I don't know if I'd call this one dystopian per say like it tends to be marketed. It is in a very small sense but not like people tend to expect. I personally loved that the characters did not rebel. It was far more realistic I feel and what really made this novel terrifying. That these people accepted their fate so easily and never questioned it at all even though they drove and were fully capable of running if they wanted. Their planned fate was all they knew and it made sense that they never ventured, not really. I could write an essay on this book lol. I do not think it is really a dystopian novel. You can read the particular problems of the protagonists as just a metaphor for the problem we all face of the shortness of life and the certainty of death. The evocation of the subtlety of communication, the fact that appropriate moments can pass and be lost for ever. The bulk of the novel, in fact, can be read as appropriate to anyone's life - yours and mine too. Michelle-- I was happy with the fact that they didn't rebel either! I think that the easy thing to do is stir up a rebellion in a book like this but I agree with that it seemed more realistic and that's what scared me about it as I said in my review. I'll have to research more about what qualifies as a dystopian novel. I'd always heard this labeled as such. I love where you talk about being able to figure out the killer on CSI. I swear that is my second superpower (after my oddly strong sense of smell). My kids thing I am amazing for this. Their shows are insanely easy to predict. So I know what you mean, but for me when something truly surprises me, it is like a treasured gift! It happens so rarely. I agree with what you said about the narrator's voice. I found her tangents pretty bothersome, but overall I enjoyed the novel quite a bit. -Battle Royale by Koushun Takami - When I was reading the first Hunger Games I felt like it was a YA version of this book. It's basically the same idea - Crazy government makes kids kill each other. This one is a little bit more gory though (keep in mind if you have a soft stomach). My favourite dystopian is "The Handmaid's Tale" by Margaret Atwood. I remember when this book first came out - I was working in a book shop and there was such a lot of hype about it that it put me off and years later, I still haven't gotten around to reading it. Your review does make it sound very interesting though. Some dystopian novels you may like. The Other Side of the Island by Allegra Goodman. The Giver/Gathering Blue/Messenger by Lois Lowry. Although, you may have already read these. Glad you liked this novel. I also thought it was brilliant. Here is a list of dystopian novels: http://leeswammes.wordpress.com/2010/06/19/dystopia-for-adults-a-reading-list/ which have an adult protagonist, and here is anther list, both with YA and adult novels: http://leeswammes.wordpress.com/2010/08/21/dystopian-challenge-completed/. I read all of the latter and I don't tihnk there was any book there that I thought was "bad", but then, I'm a real dystopia fan. This is one of my favorite books ever. I could go on for pages talking about all the things in it that make it so honest and realistic and applicable to the lives of real people. I, like you, loved that the characters didn't rebel like they do in every other dystopian novel I've ever read. I think that made it more real, because a majority of people in any society aren't going to rebel against it. They're just going to try to live their lives the best they can in the situation they are given. That's what we all have to do, and that's what the characters in Never Let Me Go did. I think that is what makes this book so touching. I'm glad you enjoyed it. I love dystopian lit also. I'm looking forward to reading Never Let Me Go, since I was also a big fan of Remains of the Day, so I'm familiar with Ishiguro's style. I would recommend Atwood, The Handmaid's Tale and also We by Yveginy Zamyatin. There is also a really funny short story by T.C. Boyle called "After the Plague" that spoofs the genre. I love dystopian, but this one left me underwhelmed. Perhaps because I had high expectations? Not sure. Perhaps it was the slow pace. I just started reading Scott Westerfeld's Uglies series, which has been great so far (I've gotten through the first 2 books so far). This book is on my list! I want to see it before the movie hehe, also I joined a dystopian challenge so I'll read it for that. This seems like something I'd like! I've had it on my to-read list for a little while, and I think I'll move it up the list now. Great review! This has been on my to-read list for a long time! You're review mentioned several aspects which I hadn't heard of before, so now I'm really keen to get a hold of it. Thanks for such a detailed review. I had this in my hands at the bookstore this weekend and I put it back. I'm really disappointed I did that. From your description, it sounds less like what I might call dystopian and more like...magical realism with a dystopian twist. More "The Giver" than "1984," perhaps? I don't know; I find the tendency to genre-ghetto everything annoying, but at the same time, this sounds like it's not a straight literary novel. I just finished the edits on Broken, a near-future dystopian thriller my company is publishing later this month, and from your review, I can't think of two "dystopias" that might be less alike than these, hah! This book has been on my shelf for a while. Now I have to bump it up my tbr list. Especially since the movie will be out soon. Thanks for the review! "Controlled," eh? I think this past week I realized just how irritated I can be by these "controlled" books. I have this on my TBR pile, though, so I'll give it a try sometime, and see if I should finish it or not!